Diller lies in the Blue River Valley near the route of the old Oregon and California trails. Freighters from Atchison and Fort Leavenworth, Kansas, passed near here while supplying military outposts to the West. Settlers in covered wagons, the Pony Express, and stage lines also followed the route. In 1854 the Oto and Missouri tribes conveyed their lands to the U.S. Government in exchange for a reservation of some 160,000 acres along the Nebraska-Kansas border; Diller lies at its western end. The reservation was slowly surrounded by advancing white settlement and in 1869 three men pre-empted the land on which Diller is now situated. In 1876 the Indians agreed to sell part of their reserve, and in 1881 they moved to Indian Territory in present-day Oklahoma. Platted in 1880, Diller was named for Samuel Diller, who assisted early settlers. David Kelley was the first postmaster. In 1881 the Republican Valley Railroad, later part of the Burlington system, completed tracks into the town. Incorporated on April 22, 1885, Diller reached a maximum population of about 500 between 1910 and 1920. Diller maintains the proud spirit of its pioneer forefathers after a century of the Good Life. 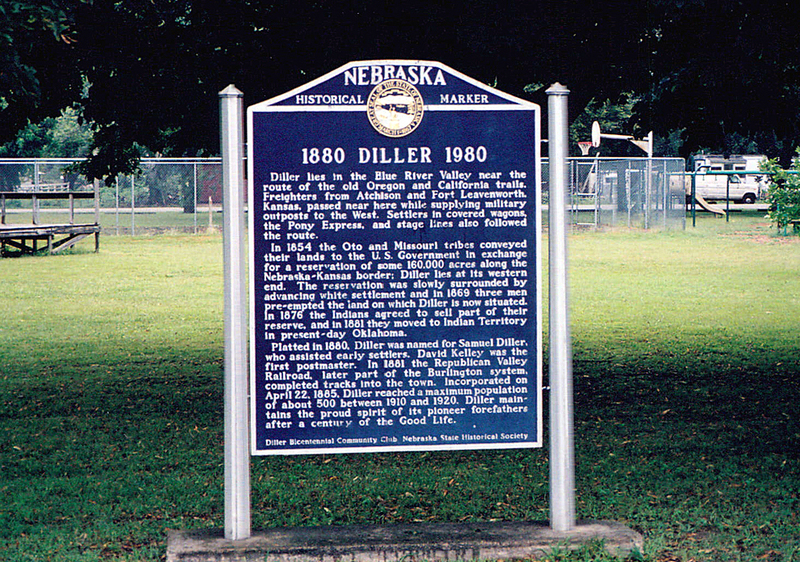 “1880 Diller 1980,” Explore Nebraska History, accessed April 18, 2019, https://mynehistory.com/items/show/291.